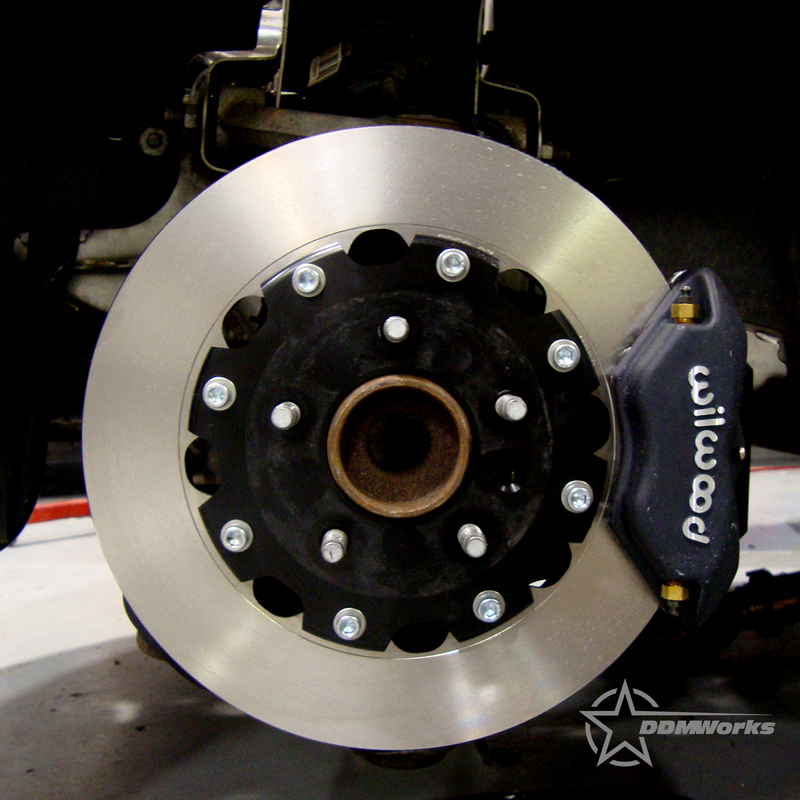 DDMWorks is proud to offer the Forged Dynalite 4 (FDL-4) Brake upgrade designed exclusively for the Kappa platform (Pontiac Solstice, Saturn Sky and Opel GT). We started out with the simple idea of offering the best performing brake upgrade available for the Kappa that could be fit under the stock wheels. The development of our kit first started by testing several different calipers and brake pads to find out what works best and what didn't work on the unique chassis of the Kappa. brake balance to be thrown off and make the vehicle unstable. We were able to carefully match the brake pads in our kit to provide an even brake balance, even if you choose to stay with the stock brake pads in the back. Braking can be improved even more with the optional brake pad upgrade we offer for the rear. 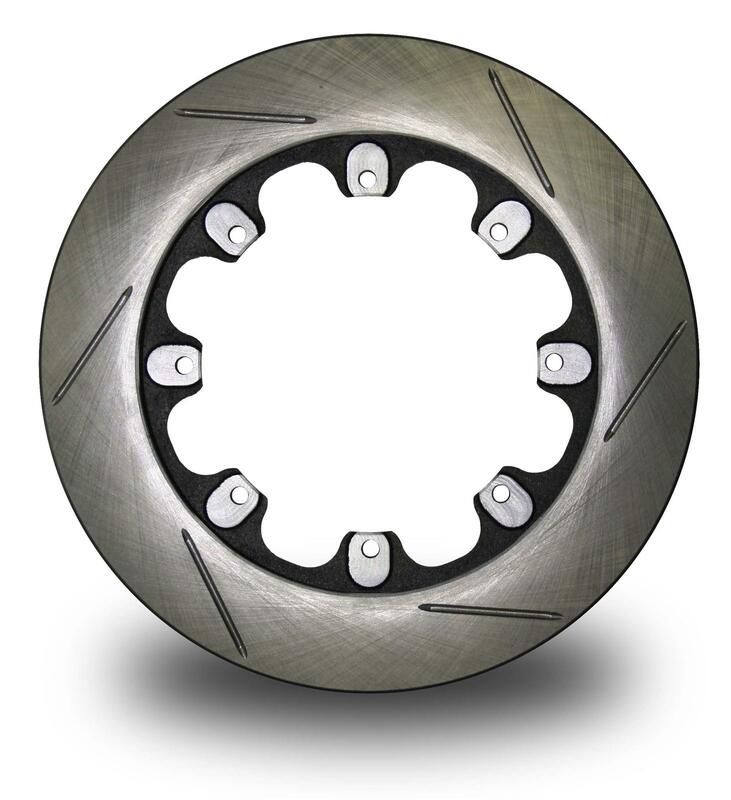 These rotors look great and also offer greatly enhanced thermal capacity from the stock setup. 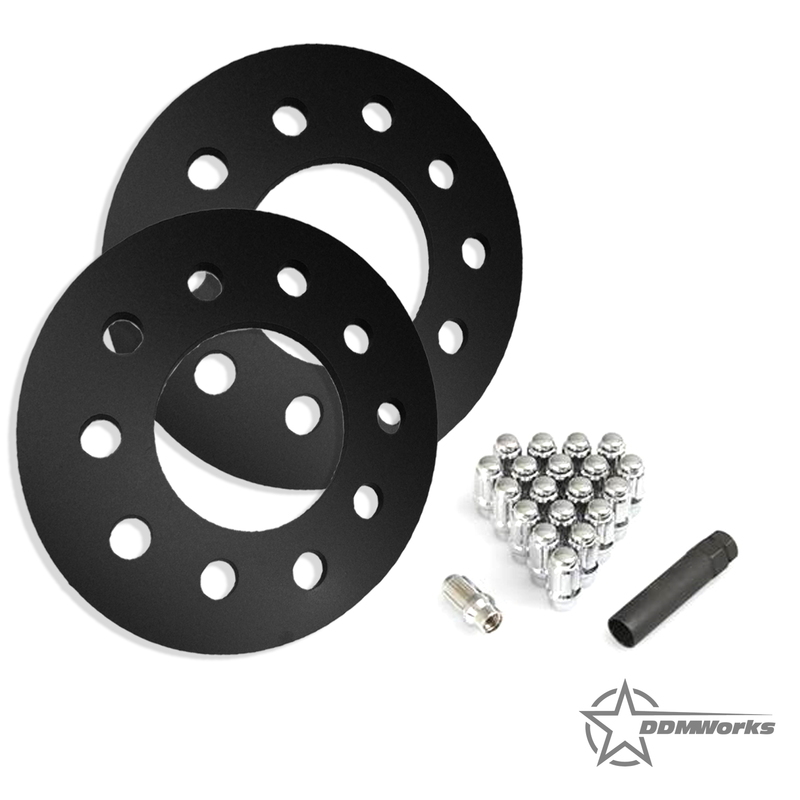 The huge 12.19" rotors are then mated to custom designed billet aluminum hats once again designed in house by DDMWorks to create the lightweight and strong 2 piece rotor for the kit that actually weighs 2.5 pounds less than the stock rotors. The rotors fit under the stock Solstice and Sky wheels and most 18" or larger aftermarket wheels. 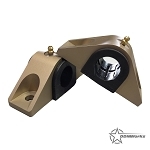 If you are installing the brake kit on your stock Solstice wheels you will need to install a wheel spacer and our extended lug nuts which can be selected as an option. 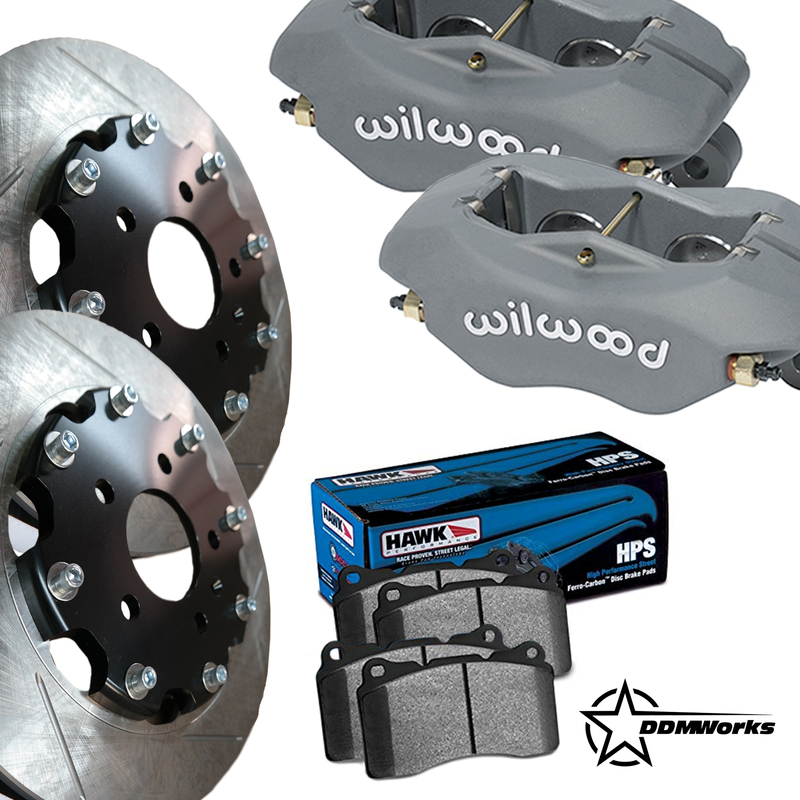 The Brake kit ships with Hawk HPS pads which work great on the street, we can supply other pad options, give us a call or drop us an email if you think you need something more aggressive. 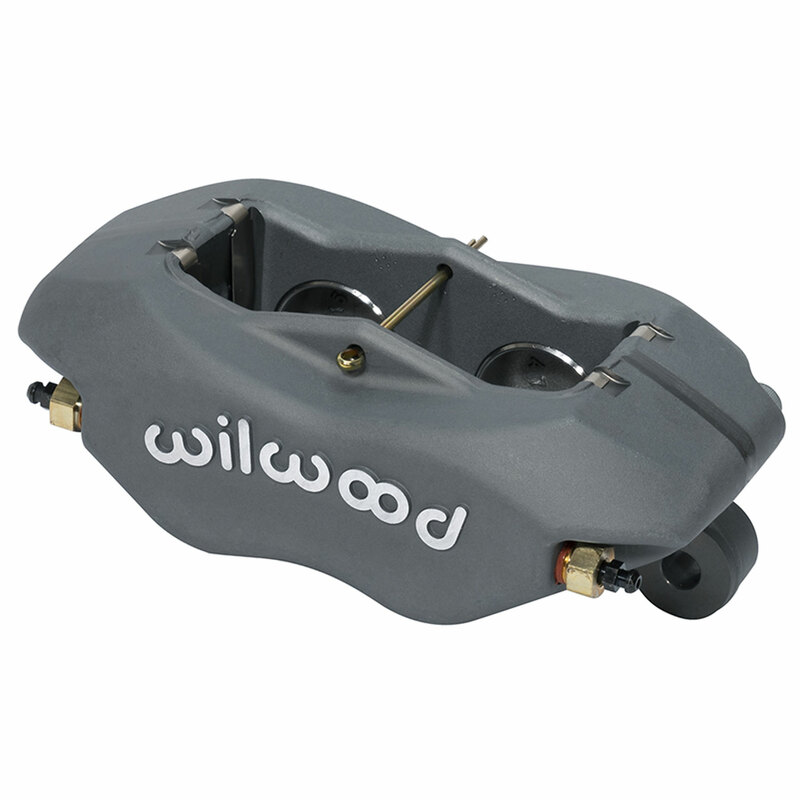 Optional caliper finishes and rotor designs you can personalize the style and look of the system just for you. Anyway you option the kit though, be prepared to stop quicker and look good doing it! Qty 2: Rotors, 12.19" x 1.25" with custom offset billet aluminum rotor hats by DDMWorks. 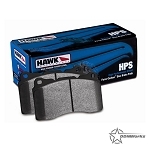 Front Hawk HPS brake pads. Rear pads can be purchased separately. Mounting hardware needed for installation. Sky Redline 2007 - Installed Big Brake kit with Hawk HPS front and rear pads already had the DDM SS brake lines - WOW - nicest braking I have had on a vehicle - stops great, no noise, nothing but comes down really fast and smooth. highly recommended. Easy to install! Literally bolt on and actually lighter than original equipment!